NASA's next Small Explorer (SMEX) mission to study the little-understood lower levels of the sun's atmosphere has been fully integrated and final testing is underway. Scheduled to launch in April 2013, the Interface Region Imaging Spectrograph (IRIS) will make use of high-resolution images, data and advanced computer models to unravel how matter, light, and energy move from the sun’s 6,000 K (10,240 F / 5,727 C) surface to its million K (1.8 million F / 999,700 C) outer atmosphere, the corona. Such movement ultimately heats the sun's atmosphere to temperatures much hotter than the surface, and also powers solar flares and coronal mass ejections, which can have societal and economic impacts on Earth. "This is the first time we'll be directly observing this region since the 1970s," says Joe Davila, IRIS project scientist at NASA's Goddard Space Flight Center in Greenbelt, Md. "We're excited to bring this new set of observations to bear on the continued question of how the corona gets so hot." A fundamentally mysterious region that helps drive heat into the corona, the lower levels of the atmosphere -- namely two layers called the chromosphere and the transition region -- have been notoriously hard to study. IRIS will be able to tease apart what's happening there better than ever before by providing observations to pinpoint physical forces at work near the surface of the sun. The mission carries a single instrument: an ultraviolet telescope combined with an imaging spectrograph that will both focus on the chromosphere and the transition region. The telescope will see about one percent of the sun at a time and resolve that image to show features on the sun as small as 150 miles (241.4 km) across. The instrument will capture a new image every five to ten seconds, and spectra about every one to two seconds. Spectra will cover temperatures from 4,500 K to 10,000,000 K (7,640 F/4,227 C to 18 million F/10 million C), with images covering temperatures from 4,500 K to 65,000 K (116,500 F/64,730 C). These unique capabilities will be coupled with state of the art 3-D numerical modeling on supercomputers, such as Pleiades, housed at NASA’s Ames Research Center in Moffett Field, Calif. Indeed, recent improvements in computer power to analyze the large amount of data is crucial to why IRIS will provide better information about the region than ever seen before. “The interpretation of the IRIS spectra is a major effort coordinated by the IRIS science team that will utilize the full extent of the power of the most advanced computational resources in the world. It is this new capability, along with development of state of the art codes and numerical models by the University of Oslo that captures the complexities of this region, which make the IRIS mission possible. Without these important elements we would be unable to fully interpret the IRIS spectra,” said Alan Title, the IRIS principal investigator at the Advanced Technology Center (ATC) Solar and Astrophysics Laboratory in Palo Alto, Calif. The IRIS observatory will launch from Vandenberg Air Force Base, Calif., and will fly in a sun-synchronous polar orbit for continuous solar observations during a two-year mission. IRIS was designed and built at the Lockheed Martin Space Systems ATC in Palo Alto, Calif., with support from the company’s Civil Space line of business and major partners Smithsonian Astrophysical Observatory and Montana State University. Ames is responsible for mission operations and the ground data system. The Norwegian Space Agency will provide the primary ground station at Svalbard, Norway, inside the Arctic Circle. The science data will be managed by the Joint Science Operations Center, run by Stanford and Lockheed Martin. Goddard oversees the SMEX program. The NASA SMEX Program is designed to provide frequent, low-cost access to space for heliophysics and astrophysics missions using small to mid-sized spacecraft. The program also seeks to raise public awareness of NASA's space science missions through educational and public outreach activities. 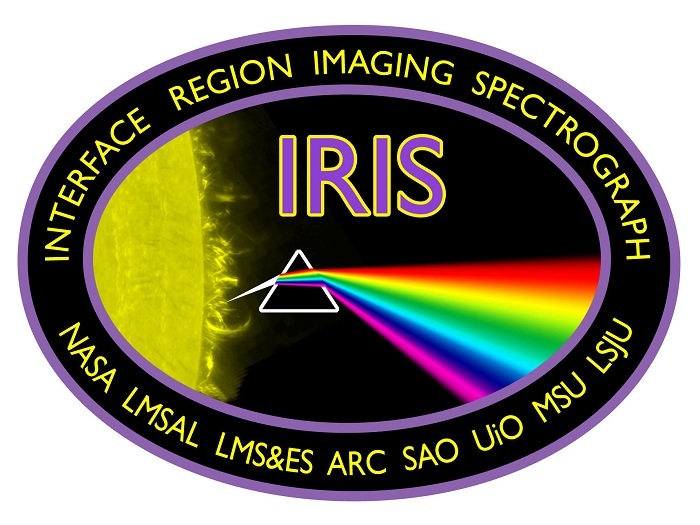 The Interface Region Imaging Spectrograph (IRIS) is a NASA Small Explorer Mission to observe how solar material moves, gathers energy, and heats up as it travels through a little-understood region in the sun's lower atmosphere. Tracking how material and energy move through this region is a crucial part of understanding the dynamics of the sun. Such information can help explain what causes the ejection of solar material -- from the steady stream of the solar wind to larger, explosive eruptions such as coronal mass ejections (CMEs) -- that travels toward Earth and causes space weather that can disrupt human technology. 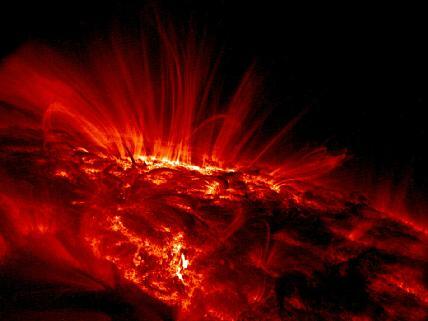 Visible in ultraviolet light, the two regions closest to the sun are called the chromosphere and the transition region. They form a violently dynamic interface region in which hot and cold plasma are mixed over a range of heights, stretching from the sun's surface to several thousand miles up. This location is where one of the most mysterious occurrences on the sun takes place. Usually the closer you get to a heat source, such as a fire, the hotter it gets -- but the solar atmosphere doesn't do that. The solar atmosphere gets hotter as it gets further away from the sun, and scientists don't yet have enough information to distinguish between various theories on why this happens. The atmosphere changes from 6,000 K at the surface to about a million K at the top of the transition region. The temperatures continue to increase up to millions of degrees in the sun's upper atmosphere, the corona, but since the lowermost layers contain more material, the strongest heating is believed to occur there. Tracking the complex processes within these layers of the solar atmosphere requires instrument and modeling capabilities that are within technological reach for the first time. 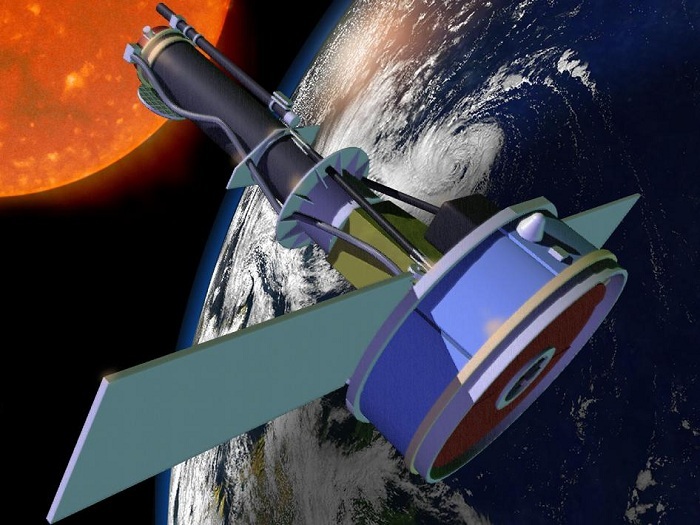 IRIS is the first mission designed to simultaneously observe the range of temperatures specific to the chromosphere and transition region at very high spatial and temporal resolution -- going beyond earlier missions that were lower resolution or did not cover a wide range of temperatures. IRIS also draws on state of the art computer modeling sophisticated enough to deal with the complexity of this area. In combination, IRIS's resolution, wide temperature coverage and computer modeling will enable scientists to map plumes of solar material as they move throughout the region and to pinpoint where in their travels they gain energy and heat. 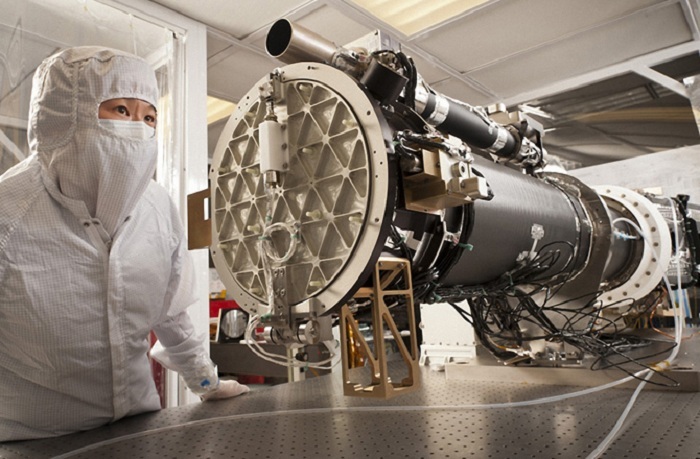 IRIS is NASA's Interface Region Imaging Spectrograph. Its primary goal is to understand how heat and energy move through the lower levels of the solar atmosphere. IRIS is a class of spacecraft called a Small Explorer, which NASA defines as costing less than $120 million. Lockheed Martin (LM) Solar and Astrophysics Laboratory in LM’s Advanced Technology Center is the principle investigator institution and has overall responsibility for the mission, with major contributions from Lockheed Martin Civil Space, NASA Ames, Smithsonian Astrophysical Laboratory, Montana State University, Stanford University and the University of Oslo. IRIS weighs 440 pounds. It is approximately 7 feet (2.1 meters) long and, with its solar panels extended, is a little over 12 feet (3.7 meters) across. The spectrograph will observe material at temperatures from 5,000 K to 10 million K. Spectra provide information on exactly how much light is visible from any specific wavelength. This, in turn, corresponds to how much material is present at specific velocities, temperatures and densities. IRIS will make use of high-resolution images, data and advanced computer models to unravel how matter, light, and energy move from the sun’s 6000 K surface to its million K outer atmosphere or corona. 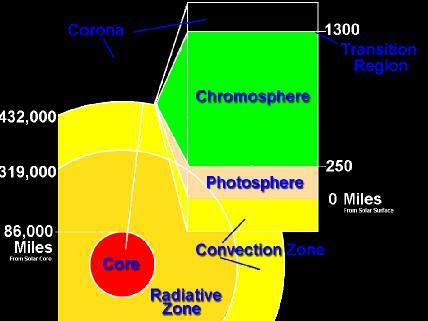 A fundamentally mysterious region that helps drive heat into the corona, this area has been notoriously hard to study. IRIS will be able to tease apart what's happening there better than has ever been done before. To do this, IRIS will observe the lowest part of the sun's atmosphere: the chromosphere, an expanse of ionized gas or plasma lying just above the sun's surface, and the transition region, where the chromosphere transitions into the even hotter corona above. This interface region lies at the core of many outstanding questions about the sun's atmosphere, such as how the sun creates giant explosions like solar flares or coronal mass ejections (CMEs), or how solar material in the corona reaches millions of degrees, several thousand times hotter than the surface of the sun itself. Much of this coronal heating begins in the chromosphere and transition region. These highly dynamic regions are constantly in motion, so it isn't simple to profile temperatures with respect to position. Indeed, a wide range of temperatures can occur at similar heights, with different swaths of material propelled upward and downward in response to the release of magnetic energy, as well as various types of plasma waves. This moving interface region covers a wide range of heights above the sun’s surface, extending over several thousand miles. Throughout this height range, not only do the temperatures vary dramatically from 5000 Kelvin to almost a million degrees, but there are also enormous density contrasts, with certain areas up to a million times more dense than others. This turbulent interface region contains more mass than does all the rest of the corona and heliosphere, which extends to the very edge of the solar system. Given how much material is there, the chromosphere requires a heating rate at least ten times greater than that of the corona itself. One of IRIS's main science objectives will be to study how this foundational region of the heliosphere contributes mass and energy to the atmosphere above it, depositing so much heat into the corona. IRIS observations will mesh with those from NASA's Solar Dynamics Observatory (SDO), which launched in 2010. SDO observes the sun's surface and the corona, while IRIS will observe the crucial region in between the photosphere and corona at much higher resolution than ever before captured. IRIS is what's called an imaging spectrograph, which means it will provide both images and what are called spectra, which splits light into its various colors. Each line of light carries information about different materials o the sun and how they move, thus they can be used to probe physical characteristics in the solar atmosphere such as density, temperature and velocity. IRIS will attempt to distinguish between two mechanisms that may be responsible for powering this region: magnetic field reconnection and dissipation of waves that travel through the solar atmosphere. Both these phenomena can add to the turbulence of the region and IRIS’s high-resolution spectra and images will be able to tease apart just which forms of energy cause which effects. Such information will also help scientists examine how the solar material and its attendant magnetic fields contribute to eruptions on the sun such as solar flares and CMEs. This may increase our ability to forecast such space weather, which can disable satellites, cause power grid failures, and disrupt GPS services. Lastly, understanding our own star better will help deepen our insight into atmospheres at distant stars as well. 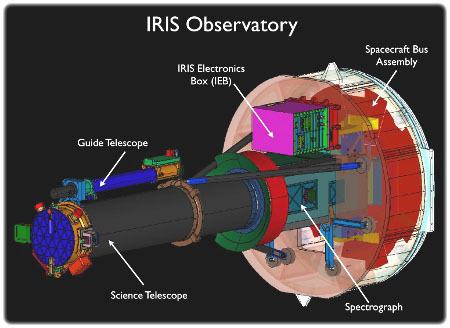 Artist's concept of the Interface Region Imaging Spectrograph (IRIS) satellite in orbit.